The Blue Shark I is a traditional Maldivian safari boat and the perfect boat for surf trips. 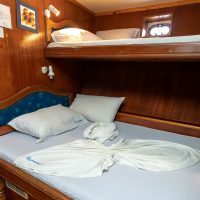 It has the ideal size, offers plenty of space on board with its several decks, is well equipped and maintained, the professional and friendly crew is always there for you. 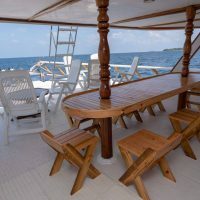 The safari boat comes with one of the best surf dhonys of the Maldives, with plenty of space to store your quiver, you material, to watch the surf, and is an excellent fishing boat. 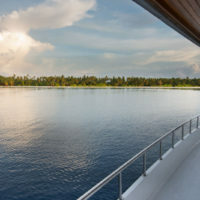 And you may leave the Maldives with some of the best shots of you that you will ever have, as one of our guides is a professional photographer with plenty of professional photo-gear. 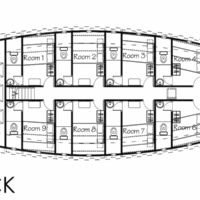 9 rooms : All cabins have twin beds and are air-conditioned. 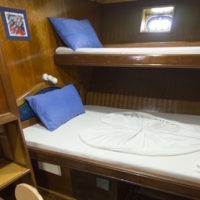 Rooms are fitted with private toilets, shower and lavabo, wardrobe, book shelf, chair and small table. The interior design is light and the materials are hygienic like the wooden parquet. 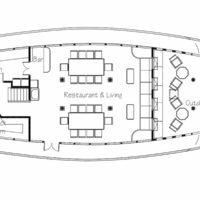 Airport pick-up, 3 meals a day, coffee, tea, drinking water (2 bottles per day), use of all onboard equipment and facilities including dhony and dingy. And plenty of photos.We are here for you! If you have any questions regarding our surf camp boat, what is included on the surf trip, or any other questions regarding the maldives surfing experience, please visit our FAQ page or contact us. Vous êtes moins de 10 personnes ? 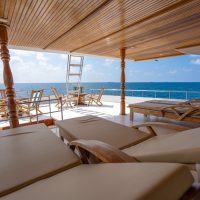 Pas de problème, vous pouvez vous joindre à une croisière solo ou vérifier la disponibilité de notre bateau Surf Camp.